Terry Matlen, M.S.W., has been an advocate for those with AD/HD for more than a dozen years. 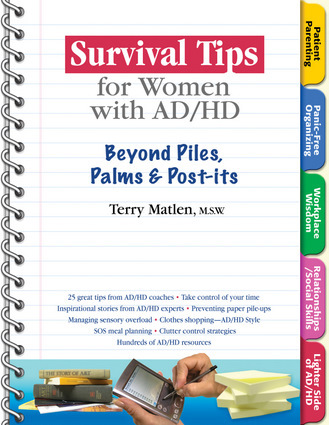 She is the leader of AD/HD support groups, the editor of the web site on AD/HD, www.ADDconsults.com, an author of articles on AD/HD, a sought-after speaker at conferences, and former member of the board of directors of the Attention Deficit Disorder Association. She lives in Birmingham, Michigan.